Atradius’ aim is to lead our customers into the future by strengthening their credit and cash management to support growth of their businesses. We continue investing in new technologies and taking advantage of opportunities in the markets. Our strategy is anchored by our distribution network of brokers and agents who deliver quality services that make a difference and where our people and global footprint play a key role. Atradius’ total revenue grew 2.5% to EUR 1,761 million in 2016 compared to EUR 1,718 million in 2015. At a constant exchange rate this marked a 3.4% increase. Europe, Asia and Oceania showed encouraging revenue growth, consistent with our expansion ambitions in these regions. The business line for multinationals (Global), Bonding and Instalment Credit Protection performed well delivering increased revenues. Gross claims ended at EUR 701.1 million in 2016, down 2.9% from EUR 721.7 million in 2015 despite a steady inflow of medium sized claims influenced by a weakened insolvency outlook in many markets. All Atradius business lines contributed to the improvement. 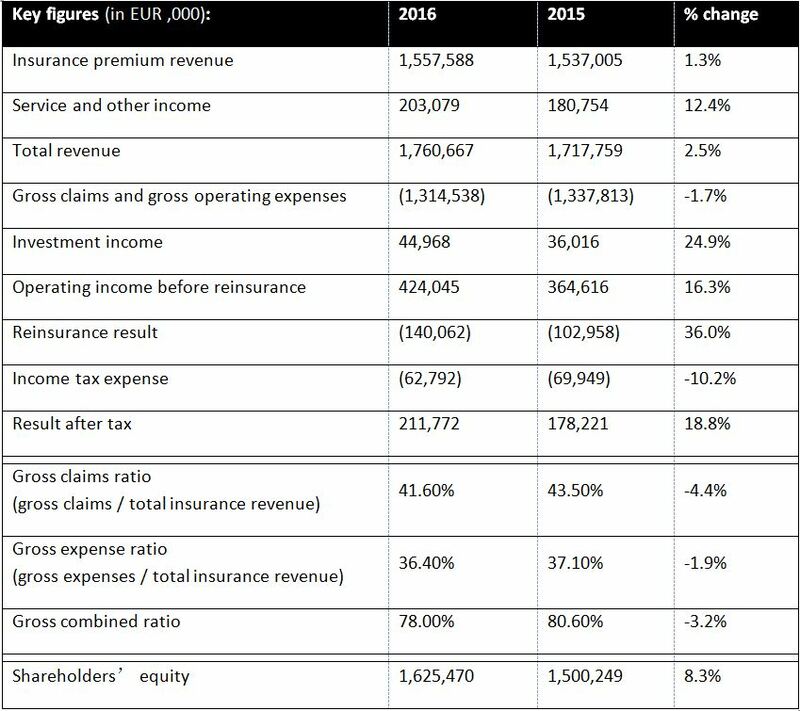 Gross insurance operating expenses decreased 0.4% to EUR 613.4 million in 2016 from EUR 616.1 million in 2015, with an improvement in the expense ratio compared to 2015. The net investment result, including the share of income of associated companies, ended at EUR 45.0 million, an increase of 24.9% compared to 2015. The impact of the persistent low yield environment was partially offset by increased dividend income and the revaluation of our existing 45% stake in Graydon after the acquisition of the remaining 55%, adding EUR 19.9 million of non-recurrent profit. Operating income before reinsurance improved 16.3% to EUR 424.0 million from EUR 364.6 million in 2015. The positive developments in claims and expenses resulted in an excellent gross combined ratio of 78.0% compared to 80.6% in 2015. The Reinsurance result of EUR 140.1 million in 2016 was 36.0% lower than that of 2015 (EUR 103.0 million) largely due to lower claims recoveries following the decrease in gross claims. The result for the year after taxes of EUR 211.8 million marked an 18.8% increase over the 2015 result for the year of EUR 178.2 million. In addition to the improvement in the operating income with better claims and expense ratios, there was a positive contribution from the service segment. Atradius consolidates with Grupo Catalana Occidente. The overall Group, including Atradius, has a very strong capital position with an estimated coverage ratio to insurance risk of approximately 200% at 31 December 2016. Atradius provides trade credit insurance, surety and collections services worldwide through a strategic presence in more than 50 countries. Atradius has access to credit information on over 200 million companies worldwide. Its credit insurance, bonding and collections products help protect companies throughout the world from payment risks associated with selling products and services on trade credit. Atradius forms part of Grupo Catalana Occidente (GCO.MC), one of the leading insurers in Spain and worldwide in credit insurance.